The ‘three Icelandic horses’ image has gotten a lot of attention, and many comments and questions from your emails and Facebook posts. I’ve been asked several times to tell their story, especially by those who’ve seen the print at the Hopewell Bistro. I love photographing horses wherever I can, including around my home, because I am always amazed by how massive, powerful and strong they are, but at the same time have such incredibly sweet, gentle, and curious personalities. Towards the end of my Iceland trip this summer, returning from the Snaefellsness peninsula, the Ring Road must cross the Hvalfjorour fjord by way of the 5,700 meter long Hvalfjorour Tunnel, submerged 165 meters under the sea, before re-emerging south towards Reykjavik. And while the tunnel is considered an engineering marvel, I followed a multitude of recommendations to bypass it, and take routes 47 & 48 the whole, long way around the entire fjord. This amazing scenic road comes complete with incredible mountains, waterfalls, solitude (everyone else is taking the most travelled road), Hvitanes, an abandoned World War II British military base, more sheep, and of course, my Icelandic horse friends. I intentionally scheduled my trip to coincide with the full moon in July, and the statistically driest month in Iceland. While I had glorious weather all week, on the last day of my trip, on the way back to civilization, the statistical rainfall average caught up with me. But in one lucky moment, negotiating one of the slick bends in the road, I came upon this group of beautiful horses hunkered down together as they must do often with no shelter or barn in site. Icelandic horses are incredibly hardy, live very long, suffer few diseases, and are direct descendants of the original horses the Vikings brought over from Norway. Icelandic law prevents horses from being imported, and exported ones may never return. Rain can be seriously inconvenient when camping but I’ve learned that inclement weather can make for fantastic photography. Exiting the 4x4 and working my way up the slope in full parka, I found that it was not so much the rain, but the sideways wind and accompanying waves, that made the entire process of holding a camera practically underwater, very problematic. I made the mistake of trying to swap lenses and later found many unusable shots sporting huge water globules on the lens. As they say in Iceland, ‘Bíta á jaxlinn’ sometimes you have to ‘bite the molar’ and just go for it. With thunder clouds above, and watching me as I clumsily approached them, the horses seemed un-phased by the storm, and more concerned for me than for themselves: ‘Hey Mr., are you okay?’. These three, very wet, tough Vikings, showing scars on their noses, approached me calmly, and were beautiful, attentive, and curious; inner peace in a raging storm. 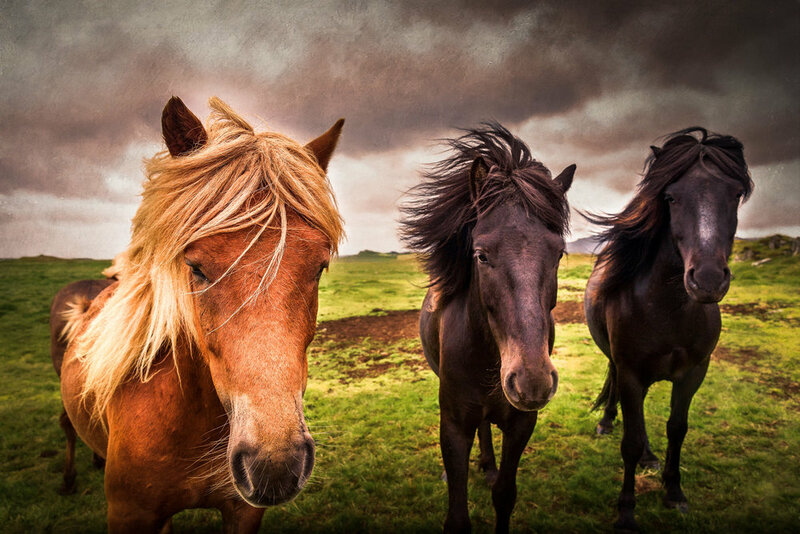 Some have commented that the horses look like they are flying or running towards the camera, but in fact it was the wind wildly blowing their manes while they posed as calm as the Buddha.